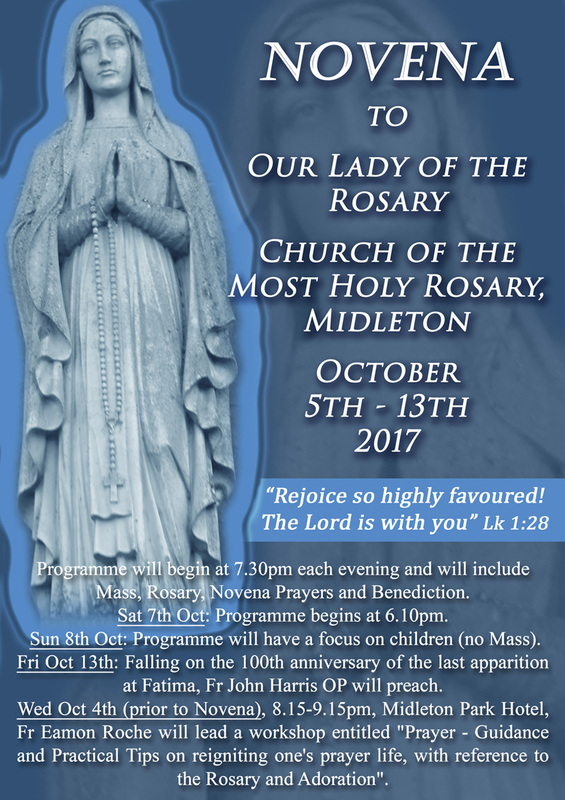 From Oct 5th-13th, in Holy Rosary Church, Midleton, a Novena to Our Lady of the Rosary will be held. Each evening, beginning at 7.30pm, the Novena will include Mass, Rosary, Novena Prayers and Benediction (except for Sat Oct 7th, when Mass will begin at 6.10pm, as per usual Vigil Mass, followed by the other prayers). The evening of Sun 8th Oct (also 7.30pm) will have a focus on children (this is the only evening without Mass). On the final night of the Novena, Fri 13th Oct, falling on the 100th anniversary of the last apparition at Fatima, Fr John Harris OP will preach. The evening before the Novena begins (Oct 4th, 8.15-9.15pm) Fr Éamon Roche will lead a workshop in Midleton Park Hotel entitled “Prayer-Guidance and Practical Tips on Reigniting one’s prayer life, with reference to the Rosary and Adoration”. Please spread the word and pray that many will hear the call of Our Lady to pray with her and partake in this Novena.